Delirium is a common neuropsychiatric disorder in hospitalised older adults. Often unrecognized, delirium is associated with increased morbidity and mortality, length of hospital stay, institutionalisation and costs to healthcare providers. The objective of this prospective cohort study was to detect the prevalence of delirium in a London (UK) hospital testing the feasibility and reliability of the 4 A's Test (4AT). Over a seven day period 174 inpatients were assessed by non-psychiatrically trained doctors using the 4AT and three widely adopted screening tools. The 4AT helped detect 21 (10.2%) delirious patients uncovering a delirium prevalence of 8.63 per 1000 hospital days. The 4AT showed a compatibility of 75% with other tools used. Changes in consciousness are often missed, but can be easily detected introducing a screening tool as the 4AT. Delirium detection, Awareness, 4AT, Assessment tools, Prevalence. Delirium is an acute, fluctuating change in mental status combined with disorganized thinking and inattention that is common in hospitalized older adults. It is considered a serious acute medical condition that is often overlooked in the elderly and it is an indicator of severe morbidity in long term care setting . The prevalence is estimated to be between 11% and 42% for patients on medical wards and close to 50% in patients with hip fractures, while the incidence of delirium arising during admission is between 6% and 56% [2,3]. Nearly a third of patients admitted to an intensive care unit develop delirium . The prevalence is also high in nursing homes and is often a sign of acute illness . Risk factors for delirium are best understood as predisposing and precipitating factors. Predisposing factors are those that are present on admission and are not changeable, e.g. age, number and severity of co-morbid medical conditions, sensory impairment, history of cognitive impairment, sleep deprivation, immobility, and dehydration . Precipitating factors are those that trigger delirium while the patient is hospitalized, the like of infections, constipations, use of a bladder catheter, pain, multiple procedures involving instrumentation, sensory impairment, and immobility . In clinical practice three major motoric subtypes of delirium have been identified . The most common one is the hypoactive delirium in which the patient is quiet, compliant, and regularly falls asleep. Rare but easily recognized is the hyperactive subtype, which occurs in fewer than 5% of cases: the patient may be combative, agitated and/or insomniac. The third type of delirium is a mixed presentation of these two forms: the patient fluctuates between the two sub-types. An attenuated form exists called subsyndromal delirium and it is defined as the presence of one or more symptoms of delirium, but the presentation pattern does not meet the criteria for a delirium diagnosis and does not progress to it . The hypoactive delirious patient is often misdiagnosed as having dementia or depression. This indicates poor surveillance and attention to indicators such as drowsiness, subtle changes of personality usually identified only by relatives, slow response to questioning and little spontaneous movements . In general considering the fluctuating nature of the syndrome delirium can be difficult to identify. Indeed, in one study it was missed in 76% of cases by emergency room physicians . Delirium, as a manifestation of acute brain dysfunction, is an important independent predictor of negative clinical outcomes including hospital length of stay (LOS), cost of care, and long-term cognitive impairment consistent with a dementia-like state [12,13]. Elderly patients with new-onset delirium do not have complete resolution of symptoms and they are more likely to be discharged to an institution other than home [3,14]. More significantly delirium during hospital admission is a strong independent marker of high risk of mortality . In older patients, the risk of death over the twelve months following an episode of delirium is doubled. When critically ill, mortality increases by 11% for every additional 48h of active delirium, highlighting the need for timely detection and treatment of the syndrome . A large US healthcare professionals’ survey conducted in 2004 highlighted the lack of a standardised approach to detect delirium in ICU, where this problem is recurrent: “Most healthcare professionals consider delirium in the intensive care unit a common and serious problem, although few actually monitor for this condition and most admit that it is underdiagnosed” . Sensing that this issue was increasing in all areas, the National Institute of Clinical Excellence prompted in 2010 health care professionals in the United Kingdom to think delirium and to observe at least daily all patients in the hospital for changes or fluctuations in usual behaviour . But a recent audit by the Royal College of Psychiatrists showed that a mental state test is still done only 47-50% of the time in general hospitals and detection by doctors without the use of a specific assessment tools is estimated to have a sensitivity of 29% [19,20]. The ideal tool for detecting delirium has not been established yet since the syndrome can present in many different ways and needs a profound knowledge of the patient. A recently validated screening tool called the 4 ‘A’s Test (4AT) has been suggested as a first line screening test for its brevity and simplicity of use . This study aims were: to detect delirious patients or at risk of developing it using the 4AT; to determine the prevalence of the syndrome to detect a potential gap in awareness; to compare the ease of use of the 4AT in diagnosing delirium against three widely used assessment tests when administered by non-psychiatrically trained personnel. The prospective cohort study was conducted in Chelsea and Westminster Hospital in London (UK). The study included 417 adult patients admitted over a period of one week to acute medical and surgical wards. Intensive Care Unit, pediatric, obstetric and private patients were excluded (170 patients). Declined consent, presence of severe dementia, dysphasia or psychiatric condition and being in the palliative care pathway were exclusion criteria (41 patients). In order to achieve representativeness in the sample, two non-psychiatrically trained doctors with anaesthetic background approached all the possible eligible 206 patients. Patients who verbally consented to be assessed for delirium were tested using the 4AT. Those who scored positive for delirium were further assessed with three instruments: the Delirium Rating Scale-revised in 1998 (DRS-R98), the Nursing Delirium Screening Scale (NuDESC) and the Delirium Motoric Checklist (DMC) [See Appendix I for details of the screening tools] [22-24]. Patient’s demographics, presenting complaint, past medical history, electrolytes levels, prescribed medications within 24 hours of delirium assessment, length of hospital stay and scores for each screening tool were recorded. Data were inputted on a Microsoft Office Excel spreadsheet for graphical representation of results. Scores for each assessment instrument were analyzed for correlation with the 4AT. The cut off score for the screening tools were: more than four when assessed with the 4AT; more than 16 for DRS-R98; equal or more than two symptoms present in the NuDESC; two or more symptoms in the DMC. It is assumed that any delirious patients excluded from the assessment because un-testable would have scored positive if tested with the 4AT, therefore their characteristics were included in the statistical analysis. The analysis was performed with IBM Statistical Package for the Social Sciences (SPSS) version 22. Patients were compared on age, length of stay, serum biochemistry (within +/-0 2 days of assessment date) excluding calcium, and total number of medications using Mann-Whitney U test for non-parametric variables; total number of medical problems and calcium level with the t-test or rank-sum test for continuous variables; gender, urgency of admission, type of patient, disease categories, and medication categories using the χ2 test for proportions. All tests’ p values were considered significant if <0.05. Clinical Governance approval was sought prior to commencement of this cross sectional prospective surveillance. The project was assigned the study number 670 and patient data management followed recommended guidelines as defined in UK Good Clinical Practice code and Data Protection Act 1998 [25,26]. All the clinical directors and matrons were notified of the audit. Treating clinicians were informed and agreed patients could be included in the clinical study. In addition, nursing staff were made aware of the audit by posters, while the nurse in charge of each of the 14 surgical and medical wards was encountered to be directly informed of the upcoming study. Verbal consent from all patients was attained before initiating any delirium assessment. Within a hospital population of 417 people, 247 inpatients were eligible (Figure 1). When the two examiners explored the wards, 28 patients were in theatre, undergoing examinations or were being transferred; 11 patients were not testable because suffered from severe cognitive impairment, dysphasia, psychiatric or terminal conditions as clearly stated in the medical notes; 2 didn’t speak English. The two assessing clinicians approached 206 eligible patients. Nine patients declined consent; for 18 patients consent couldn’t be gained for other reasons (severity of illness, language barrier, severe dementia, dysphasia, age less than 18 years, other psychiatric condition); five patients were diagnosed as hyperactively delirious by treating physicians hence they were not testable. 73 patients in total were excluded at the bedside and 174 patients were tested with the 4AT. 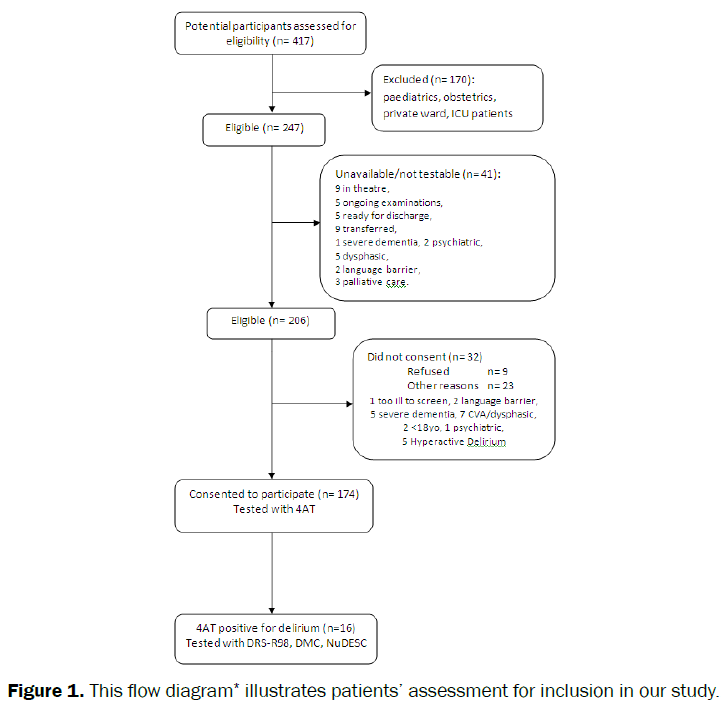 Figure 1: This flow diagram* illustrates patients’ assessment for inclusion in our study. Sixteen (9.2%) out of 174 inpatients were identified as having a change in mental status compatible with delirium that was not diagnosed previously. Therefore the total number of delirious patients in the approached hospital population of 206 patients was 21 (10.2%) giving a delirium prevalence of 8.63 per 1000 hospital days. This means that 9.8 patients need to be assessed to detect one patient with delirium. The patients who scored positive at the 4AT were assessed with the other three diagnostic tools. Six patients out of 16 were delirious according to DRS-98R, ten according to DMC and nine according to NuDESC. Compatibility with the 4AT, expressed as the ability of diagnosing the same patient as delirious, was 37.5% for DRS-98R, 62.5% for DMC and 56.3% for NuDESC (Figure 2). Figure 2: This figure illustrates the comparison of the delirium screening tools. Data is presented as compatibility % when compared to 4AT. The sample median age was 72 (Inter Quartile Range (IQR) 49.5-84). 98 (55%) patients were women and 81 men (Table 1). Delirious patients had a median age of 79 (IQR 72.5-88.5) years, significantly higher than non-delirious patients with a median age of 70 (IQR 45.75-83) years (p=0.008). There was no significant difference in distribution of gender across the two patient groups; 10 of the delirious patients were male (47.6% of the delirious cohort), whilst 71 of the non-delirious patients were male (44.9%). Delirious patients had a significantly higher median length of stay (13 (IQR 5-35.5) vs. 5 (IQR 1-12.25)) and were more likely to have unplanned (all 21 delirious patients (100%) vs. 130 (82.3%) of non-delirious patients) and medical admissions (18 delirious patients (85.7%) vs. 89 non-delirious (56.3%)). Patients with delirium were significantly more likely to suffer from cardiovascular disease (66.7% vs. 39.9%, x2 (2, N=179) =5.43, p=0.02), psychiatric problems (76.2% vs. 25.9%, x2 (2, N=179) =21.6, p<0.01) and neurological disease (33.3% vs. 15.2%, x2 (2, N=179) =4.26, p=0.04). The proportion of falls amongst the delirious group was higher (23.8%) compared to the non-delirious (12.7%), though this did not show statistical significance (x2 (2, N=179) =1.92, p=0.17). The total number of medical problems median was 9 (IQR 6-13) for the delirious, higher than the non-delirious 7.5 (IQR 5-10) and approached statistical significance, t (177) =1.76, p=0.08. There were no significant differences between delirious and non-delirious patients’ blood results within two days of assessment for delirium. To be noted that magnesium level was rarely requested (only 12 results available, only 1 in the delirious group). Predisposing factors like dementia, infection and stroke were present in 15 out of 21 delirious patients (ten diagnosed with delirium during the study, five with previously diagnosed hyperactive delirium). IQR = Inter Quartile Range, NS = not significant. Table 1: The table describes delirious and non-delirious patients’ demographics. The use of the 4AT by non-psychiatrically trained doctors proved to be effective and simple because it enabled the recognition of underestimated delirium figures. Before the study commenced only five patients were diagnosed with delirium because suffering of the hyperactive form, more recognizable. When all the patients were screened with the 4AT, other sixteen patients were identified as having a change in mental status compatible with hyper and hypoactive delirium. These figures confirm the hypothesis that delirium is still missed, especially when the patients’ behaviour doesn’t match the common idea that delirium makes the patients agitated. Surprisingly, compared with other commonly used delirium screening tools (Figure 2), the results of the 4AT were confirmed in 75% of cases, showing that the 4AT may over detect delirious patients and further testing may be necessary. One explanation can be that the 4AT provide interaction with the patient, not only its observation like other commonly used tools, and finding that the patient has a communication problem may uncover the presence of delirium. One finding that was unexpected is that observation-only tools like the DMC and the NuDESC were the most compatible ones with the 4AT compared to the DRS-98R, a tool that is considered the gold standard of delirium diagnosis. DRS-98R seemed to be not as reliable despite using a low cut-off. The DRS-98R is not easy to be used by non-experts in neurological assessment. It provides a detailed assessment of any possible changes in cognition but they need to be interpreted by experts in the field. It is worthy to note that the only tool that differentiates between subtypes of delirium was the DMC. Delirium can be a sign of clinical deterioration, therefore early recognition of delirious deviation will have the benefit of warning the clinician of a possible worsening in patient’s condition. Moreover, many of the risk factors for delirium are potentially modifiable but often undetected like a possible magnesium level derangement because rarely requested as happened during this study . Improved recognition by both nursing staff and doctors and prompt effective treatment of delirium risk factors warrant better management of the disease. The prevention of adverse clinical outcomes and longer LOS due to delirium may have positive financial implications This is way routine monitoring for delirium in ICU is widely accepted as a standard of care [27-29]. This practice should be transferred to acute hospital wards to detect signs of changes in cognition. Nursing staff is ideally placed for assessing patients due to their close patient contact throughout the day and night . For this purpose a quick and easy tool like the 4AT can be implemented in wards and theatres. It proved to be compatible with professionals’ tight schedule and limited training in detecting delirium. If any change in behaviour is present, a healthcare professional that is trained and competent in the diagnosis of delirium should carry out a clinical assessment to confirm the diagnosis as per NICE guidelines, without forgetting the value of a full medical history taking with the involvement of outside carers and relatives . The generalizability of the study is impaired by the fact that during the study period not all the patients were available for the assessment. Moreover some of the excluded patients belong to categories at high risk of developing delirium (stroke and palliative care). Therefore the calculation of a true prevalence was not possible and it was probably higher than estimated. The absence of all the electrolytes levels and the difficulty of gaining detailed information regarding pro re nata medications did not allowed a correlation with common risk factors for delirium and the number of delirious patients was too small to achieve a meaningful association. Further studies including multi center ones may be useful to detect a real prevalence and the precipitating factors for delirium. This study showed that the 4AT enables non psychiatrically trained staff to quickly and reliably assess patients for changes in consciousness. Since delirium is still severely under-recognized on the wards, recognizing delirium can have a large effect on hospital bed availability and cost of care due to longer hospital stay and increased morbidity and mortality. As we strive to improve prognosis and patient care while reducing costs, raising awareness and knowledge of delirium has multiple beneficial effects: it will improve patients care and possibly shorten their stay with favorable financial implications. The authors would like to thank the clinical staff in the medical and surgical wards at Chelsea and Westminster Hospital, London, for their collaboration and support. A special thanks to Ms Fiona Clarke and Ms Hanna Payne for their cooperation. Chelsea and Westminster Hospital Clinical Governance approval was sought prior to commence this audit. The audit was assigned the study number 670 and patient data management followed recommended guidelines as defined in UK Good Clinical Practice code and Data Protection Act 1998. Arinzon Z, et al. Delirium in long-term care setting: indicator to severe morbidity. Arch Gerontol Geriatr. 2011;52:270-275. Siddiqi N, et al. Occurrence and outcome of delirium in medical in-patients: a systematic literature review. Age Ageing. 2006;35:350-364. Inouye SK. Delirium in hospitalized older patients. Clin Geriatr Med. 1998;14:745-764. Salluh JI, et al. Outcome of delirium in critically ill patients: systematic review and meta-analysis. BMJ. 2015;350:h2538. Boockvar K, et al. Delirium during acute illness in nursing home residents. J Am Med Dir Assoc. 2013;14:656-660. Inouye SK, et al. A predictive model for delirium in hospitalized elderly medical patients based on admission characteristics. Ann Intern Med. 1993;119:474-481. Inouye SK and Charpentier PA. Precipitating factors for delirium in hospitalized elderly persons. Predictive model and interrelationship with baseline vulnerability. JAMA. 1996;275:852-857. Stagno D, et al. The delirium subtypes: a review of prevalence, phenomenology, pathophysiology, and treatment response. Palliat Support Care. 2004;2:171-179. Cole MG, et al. Subsyndromal delirium in older people: a systematic review of frequency, risk factors, course and outcomes. Int J Geriatr Psychiatry. 2013;28:771-780. Fong TG, et al. Delirium in elderly adults: diagnosis, prevention and treatment. Nat Rev Neurol. 2009;5:210-220. Han JH, et al. Delirium in older emergency department patients: recognition, risk factors, and psychomotor subtypes. Acad Emerg Med. 2009;16:193-200. Balas MC, et al. Outcomes Associated With Delirium in Older Patients in Surgical ICUs. Chest. 2009;135:18-25. Girard TD, et al. Delirium as a predictor of long-term cognitive impairment in survivors of critical illness. Crit Care Med. 2010;38:1513-1520. American Psychiatric Association. Practice guideline for the treatment of patients with delirium. Am JPsychiatry. 1999;156:1-20. McCusker J, et al. Delirium predicts 12-month mortality. Arch Intern Med. 2002;162:457-463. Ryan DJ, et al. Delirium in an adult acute hospital population: predictors, prevalence and detection. BMJ Open. 2013;3. Ely EW, et al. Current opinions regarding the importance, diagnosis, and management of delirium in the intensive care unit: a survey of 912 healthcare professionals. Crit Care Med. 2004;32:106-112. Royal College of Psychiatrists. National Audit of Dementia Care in General Hospitals 2012-2013.
van Eijk MM, et al. Comparison of delirium assessment tools in a mixed intensive care unit. Crit Care Med. 2009;37:1881-1885. Bellelli G, et al. Validation of the 4AT, a new instrument for rapid delirium screening: a study in 234 hospitalised older people. Age Ageing. 2014;0:1-7. Trzepacz PT, et al. Validation of the Delirium Rating Scale-revised-98: comparison with the delirium rating scale and the cognitive test for delirium. J Neuropsychiatry Clin Neurosci. 2001;13:229-242. Gaudreau JD, et al. Fast, systematic, and continuous delirium assessment in hospitalized patients: the nursing delirium screening scale. J Pain Symptom Manage. 2005;29:368-375. Meagher D, et al. A new data-based motor subtype schema for delirium. J Neuropsychiatry Clin Neurosci. 2008;20:185-193. Yanamadala M, et al. Educational interventions to improve recognition of delirium: a systematic review. J Am Geriatr Soc. 2013;61:1983-1993. Siddiqi N. Preventing delirium in older people. Nurs Times. 2011;107:22-23. Barr J, et al. Clinical Practice Guidelines for the Management of Pain, Agitation, and Delirium in Adult Patients in the Intensive Care Unit. Crit Care Med. 2013;41:263-306. Grol R and Grimshaw J. From best evidence to best practice: effective implementation of change in patients' care. Lancet. 2003;362:1225-1230.